Summertime means more dirty clothes. Make sure you check the washing machine hose for leaks, bulges or cracks. Remove the dryer lint on a regular basis. The hose should be replaced every three years. The washing machine should be placed at least 04-inches from the wall in order to prevent hose kinks and damage. Make sure you don’t leave your home while the machine is running. The ductwork can sweat from condensation during the humid weather. It may cause backups if your drains are not clear. On the other hand, leaks in the seams also can cause condensation. Make sure there is no water in the drain pan if you have an attic installation. If you find water in the drain pan, call ARS / Rescue Rooter right now. It will help save your ceiling. Look out for what you put down the kitchen disposal after cooking. Most of them are not equipped to handle celery, banana peels, corn husks, and other fibrous foodstuffs. Fats and cooking oil should also be kept away from the kitchen disposal system. They can form clogs in the pipes. Make sure you run cold water for at least 15-seconds (at full pressure) after you put down the disposal. This will help flush the disposal through. Never put potato mixes down the drain. They will create an immediate clog when water is added. Eggshells, rice, and pasta should also be avoided. Save money and energy while on your vacation by turning down the temperature of your water heater as well as turning up the temperature of the refrigerator. Make sure you remove all the highly perishable stuff like meat and dairy foods first. 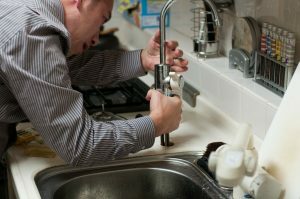 Schedule an annual maintenance inspection to prolong the lifespan of your plumbing system. It will help prevent any expensive repairs and replacements in the long run.